Yesterday the Simple Delta kite was able to show what it could do in a fairly smooth moderate breeze, on 100 meters of line. Looking outside, it was evidently another thermal day, although the average wind strength seemed to be a lot less than on the previous outing with this kite. Down at the reserve, it proved tricky to launch the Delta in the long lulls due to its fairly modest light wind performance. By the look of the numerous cumulus clouds drifting slowly overhead at around 4000 feet, the winds aloft seemed to be at least moderate in strength. Down low, it was pretty light and gusty, with the wind direction changing dramatically from minute to minute. I managed to get a few camera shots of the Simple Delta kite while it was still low enough for a good-quality picture. 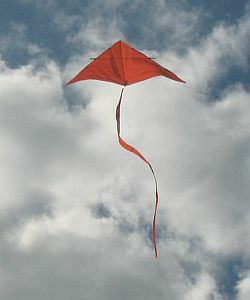 It took a few tries, with the kite tending to drop to the ground while I was clicking away with one foot on the winder! Half an eye had to be kept on little Aren too, who had found his way to the play equipment not far away. 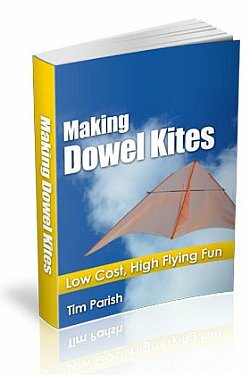 Making Dowel Kites is one of my e-books that's worth a look (or printing off) when you want to explore bigger and better kites. Using similar materials and construction methods - that is, just dowels, plastic and tape. At one stage, I backed up while trying to keep the Delta airborne and ended up some distance from the winder. However, such is my dedication to kite flying and bringing all the sublime details to you, that I soldiered on with the flying session. Despite a numb ear covered in blood from a small gash. A couple of investigating fingers ended up covered in blood too. Up over 100 feet or so, the air was much less gusty, with smoother increases and decreases in strength. The line angle varied between 30 and 65 degrees depending on wind strength and thermal assistance. For quite a while, the kite seemed to be flying at close to its optimum wind speed, at 60 degrees from the horizon. Of the 4 or 5 longish flights it's had so far, this was the smoothest this Delta had ever flown. See the video, where it just tracks slowly back and forth with a straight tail. I kept walking back upwind, letting out more line. Once or twice I had to haul some line back in, before climbing the kite back up in the next long gust or patch of rising air. It was enjoyable letting line slip through my fingers at just the right speed to climb the Simple Delta kite out along the line-of-sight. That is, keeping the line angle constant. For a minute or so, the wind strength was right on the limit for the kite, causing it to travel a long way to the left or right. The Simple Delta kite would do this completely on its side, before recovering and heading back towards the top center of the flying window. With around 100 meters (350 feet) of line out, I found myself amongst the trees near the edge of the reserve. This was necessary to keep the kite a safe distance from the trees far downwind. The wind was blowing across the reserve in a direction which gave less room in case of a sudden problem with the kite. For the first time, I was able to enjoy flying the Simple Delta kite at a decent height and line angle for more than half an hour. No slipping spars this time, so its light wind performance was better than before. Line tensions varied from very firm during the sideways flying mentioned earlier, to very light as the Delta floated gently upwards in lifting air. Sometimes, during these light-tension episodes, the line would bow in several directions at once, as it encountered differing wind gusts along its length. Also, the Delta sometimes just glided around like a paper plane when wind speeds dropped far enough, almost drooping the line onto the grass. Finally, a strong, extended period of fresh wind forced the kite into a dive towards the ground. All the way from 250 feet or so! Just before impact, I noticed a tree rather close to the kite, just down-wind of it. Hence I didn't throw the winder down-wind to cushion the crash. It was a knee-jerk decision, since I normally try to take all the tension out of the line to slow down the kite in this kind of situation. In this case, I guess I could just see the kite plunging deep into that tree if it went any further down-wind! Aren and I walked to the kite, winding on line as we went. Surprisingly, the Simple Delta kite showed no signs of any damage despite the full-on power dive smacking it into the ground! The ground was grassed and perhaps a bit soft from recent rain, so that would have helped, no doubt about it. Fortunately, the kite missed the asphalt parking area just a few meters away! Making The MBK Dowel Delta Kite is one of my handy e-books of printable step-by-step instructions. It's a PDF file download.